The Celebration for Geralyn Powers will be on September 13, 2013 at 1:00 pm and 6:00 pm in addition to being a part of Saturday Sampler on September 14, 2013. 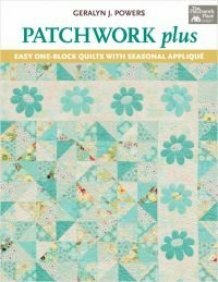 We will have a trunk show and a book signing as this is Geralyn's first book published with That Patchwork Place and we are excited to host this celebration honoring Geralyn and her much deserved success! 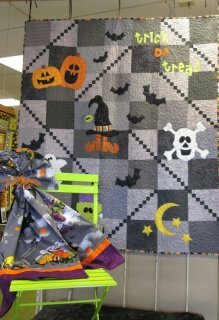 We have been working on the fall class schedule and we will have the All Nighters on September 20, October 18 and November 15. Class starts at 6 pm and goes until the last lady leaves. Will it be 2 am or 6 am, or somewhere in between? Grab your projects and come enjoy food and laughter while you finish your UFO's! Additional class information will be coming soon. 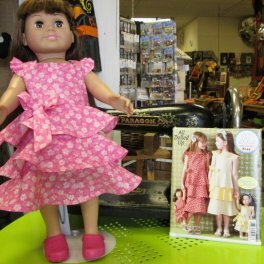 We just got in fabric that you make doll clothes with. No pattern is needed, just cut out the panel and sew together. Such an easy way to make clothes for the Dolls. 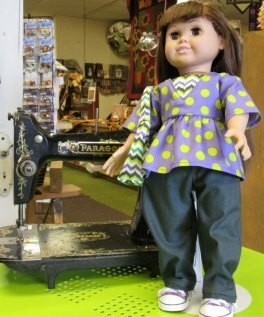 We also have EZ Sew patterns to make more doll clothes. 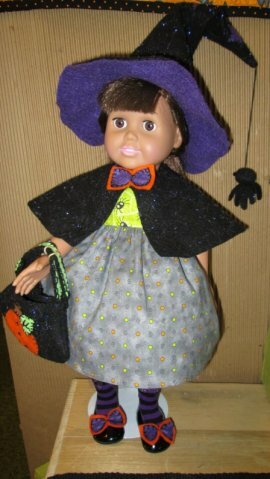 We even have patterns for Halloween doll clothes! Isn't she cute?